What do our doctors say about our programs? I want to personally thank Rob Kessinger DC. This weekend he successfully handed me the missing pieces of the puzzle in my understanding of the immune system and how to treat it successfully. This weekend was truly a game changer for me, thank you so much Dr. Rob! Rob’s an excellent teacher; endocrine content very interesting. These cases make up about 70% of what I treat. My Heart Bursts with gratitude for the amount of information and understanding that the DABCI program imparts. Keep offering these classes. I love them! Just wanted you all to know I just passed my DOT CME exam on Saturday. Thank you all for the excellent webinar. I can’t tell you how much I appreciate the incredible content and teaching. Dr. Rob and Dr. Darren are gifts to this profession. I’m blown away by their knowledge, teaching, and graciousness as they help us to become DABCI doctors. I am so grateful for the good work that you all do. Thank you, thank you! I liked the DOT webinar and would recommend the format to others. Lots of material covered. Thank you for sending the notes beforehand. I am glad that you guys gave me a push to do this drug testing. I am so excited! I have been certified for over two years, but my certificate was just in my drawer. Until I took your class, I finally realized what I have been missing out. The best part about the whole class was that Dr. Kessinger team was always ready to help me step by step to start the Drug Testing Program. Things are rolling, and I am so happy. The best part of the seminar was the questions and answers, hands on and detailed information. What I enjoy most about the course is the mass amount of information I am taking in. I feel challenged by the DABCI instructors. They do a wonderful job presenting the material! Excellent across all areas!! Dr. Kessinger was awesome! Loved the clinical correlation. Really brought a lot of things together that I was confused about before. Great Seminar! Appreciate all the visual aids. Dr. Kessinger made it very clinical. I liked how he took a patient from start to finish (thyroid: what we would see, lab values and what he does to fix the patient). Lots of nutrition tidbits! Dr. Kessinger was so excited about the material that it made it easy to learn. He also did a great job of giving ways to implement the information in real life on Monday mornings in our practices. 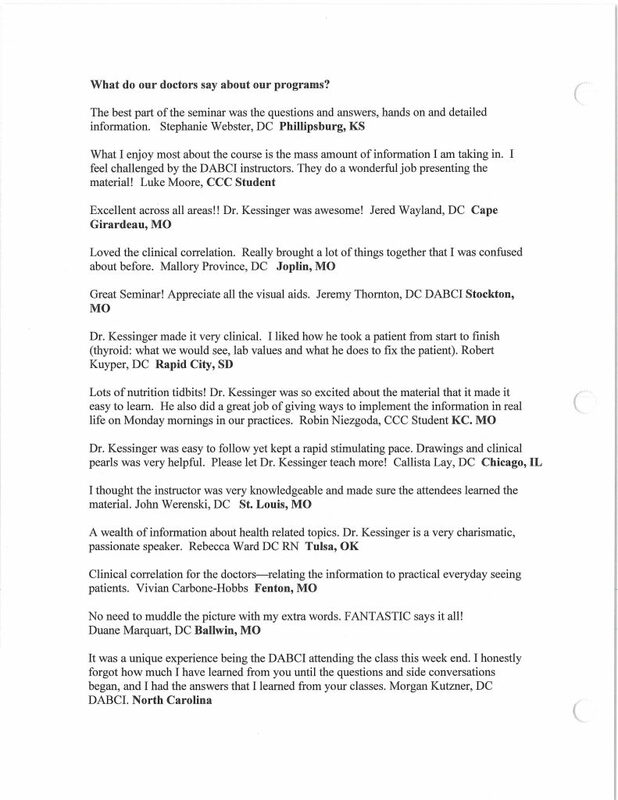 Dr. Kessinger was easy to follow yet kept a rapid stimulating pace. Drawings and clinical pearls was very helpful. Please let Dr. Kessinger teach more! I thought the instructor was very knowledgeable and mad sure the attendees learned the material. A wealth of information about health related topics. Dr. Kirchner is a very charismatic, passionate speaker. Clinical correlation for the doctors—relating the information to practical everyday seeing patients. No need to muddle the picture with my extra words. FANTASTIC says it all! It was a unique experience being the DABCI attending the class this week end. I honestly forgot how much I have learned from you until the questions and side conversations began, and I had the answers that I learned from your classes.